Please turn in the payment by September 27th. Arrow of Light Invitational This Sunday! Sunday October 1st is our annual Arrow of Light Invitational. This is an event for Webelos scouts to come and visit the troop. Arrow of Light Scouts and Parents - Please join us from 1:00pm - 3:00pm at the American Legion Post 437. The troop will be running a number of scout activities to give you a flavor of what Scouting is like and what makes Troop 437 a great troop! Troop 437 scouts - Troop scouts should plan on attending in order to help run events and host our visitors. Scouts will need to show up early to help setup activities. Exact details will be sent out seperately. Troop 437 parents - Troop parents are encouraged to also attend to be available to talk with Webelos parents about scouting and our troop. Calling all troop parents - Trying to figure out Scouting? Have questions about summer camp? What are all the ranks about? Questions about how the Troop runs? Come to a special parents information meeting for parents during this week's Troop meeting to get the inside scoop on Troop 437 and Scouting. The Parent's meeting will be held inside at the Legion hall while the Scouts are conducting their meeting activities outside. Parents of new scouts are particularly encouraged to attend but we welcome all parents to attend if they would like. At the start of 2016 the BSA released updated rank requirements and provided a year long transition period. 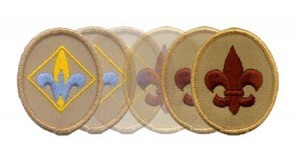 That period is now over and all Scouts must use the new requirements. For scouts with old handbooks (almost everyone in the troop who did't join this year) you can print out a new Rank Requirements Insert and staple or paperclip it in whole or just select pages into your handbook. Once you have the new requirements insert you can work with older scouts or the Scoutmaster to transfer requirements you have completed into the new insert. If you have any questions please contact the Scoutmaster. 2016-2017 yearly troop dues and BSA registration fees are past due. Troop dues are $50 and the BSA registration fee is $26. An optional Boys Life magazine subscription can be added on for an additional $12. These fees can be paid by one check made payable to Troop 437 and need to be turned in by October 13th. If you have any questions or concerns please contact Mr. Carpenter (treasurer) or Mr. Barnard (Committee Chair). The 2017 2018 Troop Calendar is now available. You can download a PDF using this link below or consult the calendar on this web site. Want to sync the calendar to your smartphone, tablet, or computer? You can do that also - simply click this link or click on the calendar graphic to the left. Our 5th annual Bike Sale is done and what a fantastic success it was! First, a big thank you to all the troop members that took time out of their busy weekend schedules and helped us out Friday evening at the Legion and today at the Common. Without everyone's help this event would not be the big event that it has become. I had countless people telling me that they now look forward to the sale and plan on attending - you are building a legacy for the Troop in our community! Secondly, special thanks to Scott Parr. Scott was the mastermind behind this year's sale and did much of the heavy lifting to ensure all the details were taken care of. Thank you Scott! Lastly....we earned more money this year then in any prior year. The sale continues to grow each year and the Troop will certainly benefit from the proceeds of the sale. Want to know how much we earned come find out at the Troop meeting this week! 7th Annual Bike Sale a Huge Success! Your Scout & family efforts made it happen -- THANK YOU. We sold lots of bikes and saw lots of happy faces on young kids as the sat astride their new purchases!